Celebrating 41 years of cycling along the Wabash River Corridor, the Wabash River Ride takes place on August 24th, 2019 from 7 am to 5 pm. 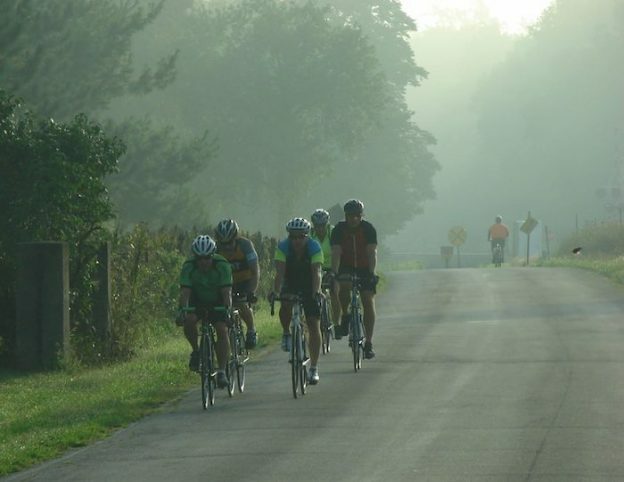 Join cyclists of all levels for well-organized and supported routes of 33, 47, 66 or 107 miles through Tippecanoe, Fountain and Warren counties. Along the routes are scenes quite different from North-Central Indiana’s typical landscape of corn and soybeans: views of the Wabash River and Big Pine Creek, iconic landmarks such as the Fountain County Church, historic Rob Roy Covered Bridge, and Shawnee (Williamsport) Bridge, and rolling hills around the river valleys that make for a fun and challenging century. Multiple support vehicles will be patrolling the routes, so you can ride with confidence. To fuel your ride, we’ll continue our renowned tradition of home baked cookies and other sweet treats from our club members. Of course, we’ll also have a variety of fresh fruit and salty snacks. We’re trying something NEW for this year’s post-ride meal! We’ll have food trucks from Boiler Garden, The Guac Box, and Famous Franks at Fort Ouiatenon. Your registration will get you a ticket for food from the food truck of your choice. If you register before August 16th you will be eligible for the FREE bicycle give-away courtesy of Hodson’s Bay Company with the name of the winner posted on the day of the ride! Online registration and chance to win a bike ends August 16th! This year, the WRCC is excited to partner with the Wabash River Enhancement Corporation WREC to enhance appreciation of the natural beauty of the Wabash River Corridor and surrounding environment. The WREC is a non-profit 501c3, community-based organization in Lafayette, Indiana. They work extensively within the community to improve the Wabash River Corridor and watersheds by planning and implementing projects that increase environmental management, research and public accessibility to the waterways and land. The Wabash River Ride and the Wabash River Enhancement Corporation is a natural partnership, as daily rides with the WRCC and the routes of the Wabash River Ride wind throughout the corridors and watersheds. The WRCC hopes that our partnership will bring awareness to the vital work that the WREC has done and will continue to do for our river. Learn more about the WREC on their webpage, or learn more about becoming a sponsor at https://wrcc-in.org/page/wrsponsor. This entry was posted in Recreational Day Ride on August 24, 2019 by anonymous.